Holly grew up in Frankfort, MI. She graduated from Northwood College with a Hotel and Restaurant degree and followed that with a professional certification from Cornell University’s Hotel and Restaurant School. She has been living in Suttons Bay where her husband grew up for several years now. 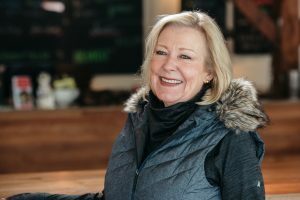 She and her husband Jerome were drawn back to Leelanau County (as so many find ourselves) after living out east in the New York metro area for about 16 years. While living in New York Holly managed one of New York’s finest French restaurants, called Mirabelle, that was awarded “3 stars” from the NYTimes as well as yearly awards from the Wine Spectator for the wine list which she crafted. Holly and her husband came back to open a restaurant in Lake Leelanau called The Key to the County. After leaving the restaurant Holly worked as a fine wine sales rep for several different Michigan wholesalers. Through her work in wine sales Holly had the opportunity to travel to many of the world’s most famous wine regions. She is a Certified Sommelier with the Court of Master Sommeliers. Holly and her husband have two grown kids; one is currently a kitesurfing instructor and living in Costa Rica and the other is a mixologist extraordinaire in NYC. Holly also abides with two furry family members – a rescue hound (a real dog – black lab mix) and the world’s largest pug, Chairman Mao (kind of a pretend dog).